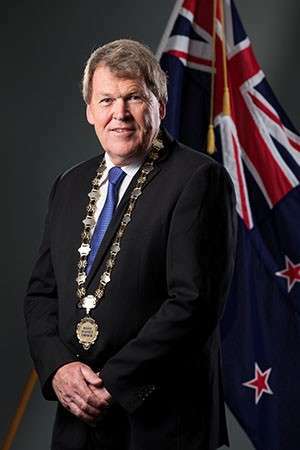 Jim is currently serving in his second term of Mayor of Waipa, the Home of Champions. Jim has had a 25 year management career in local government and has been involved in numerous successful projects throughout the Waipa region. From 2002-2009 he was the Chief Executive Officer at Maungatautari Ecological Island Trust. The Trust was formed in 2002 with a vision to remove, forever, introduced mammalian pests and predators from Maungatautari, and to restore to the forest a healthy diversity of indigenous plants and animals. He worked to establish an organisation that was capable of achieving a vision that had never been achieved anywhere else in the world and at a scale that many felt was an impossible objective. In seven years he was directly responsible for raising $17.5m required for the construction of 47km of pest-proof fence around 3,400ha of indigenous forest in difficult terrain, made significant progress with the eradication of all pests within the fence and commenced an ambitious reintroduction programme. Jim served as the Chairman of the Te Awamutu College Board of Trustees for 12 years, from 2000-2012 and remains passionate about community, families and education. Prior to becoming Mayor, he had also held a number of managerial and directorship positions.